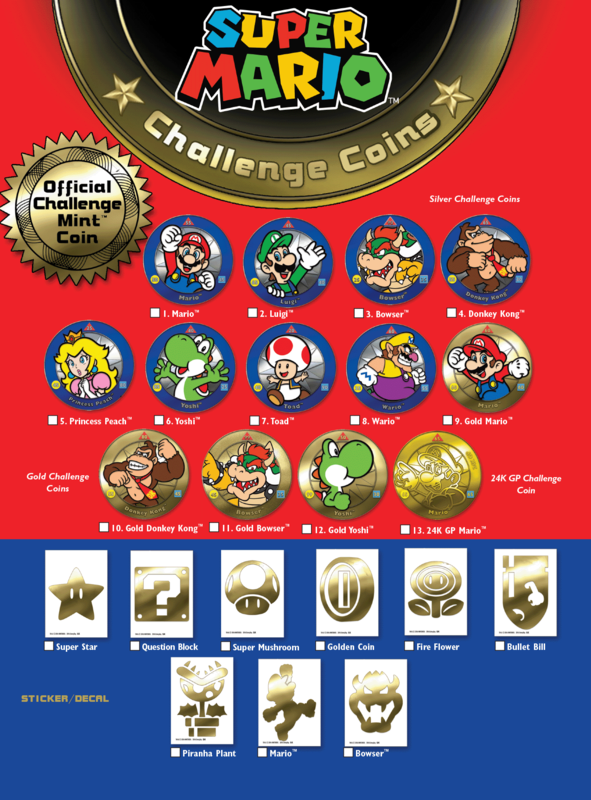 Great new collectible fun is here with the all-new Super Mario Challenge Coins! A stunning collection made up of silver finish coins, gold finish, a 24 karat gold-plated Mario, and foil-stamped decal/stickers. These official Challenge Mint™ coins are 1½" metal coins, substantial, shiny, satisfying to hold, and fun. Whether you're an established Mario collector or coin collector, or are looking to start a satisfying and visually stunning collection, Super Mario challenge coins are the perfect choice! YouTube Video of pack opening (not affiliated with us, but really shows this product). Challenge coins are built on a military tradition of receiving a challenge coin in recognition of achievements from academics to heroism. Among a group that has received coins, one person slams their coin down and the last to pull out their coin has to pay or clean the barracks – the last to play has to pay! Today that tradition has evolved far beyond the military. Presidents, representatives, police departments, clubs, and more have their own challenge coins. With Challenge Mint coins you can create your own challenges using the shapes, colors, and numbers that are on each coin!